В связи с критическим дефектом пути на неопределенный срок невозможен правый поворот с ул. Академика Павлова на пр. Московский - все вагоны 6, 8 и 27 маршрутов следуют через ул. Кошкина и Плехановскую (8 маршрут - заезд к Металлисту), либо оборачиваются через парк Машиностроителей и возвращаются обратно к Ун. Харьков. ОТМЕНЕН ---- Ремонт въезда на разворотный круг "Южный вокзал"
Одесская - Морозова - Плехановская - Конный рынок - Московский пр. - Кошкина - Московский пр. - Конный рынок - Плехановская - Одесская до 08.2019 Ремонт пр. Московского на участке от пл. Конституции до Харьковской наб. 602 мкрн - Академика Павлова - Московский пр. - ул. Кошкина - ул. Плехановская - Московский пр. - ул. Академика Павлова - Салтовское ш. - 602 мкрн. ---- Ремонт пр. Московского на участке от пл. Конституции до Харьковской наб., а также ремонт вьезда на разворотный круг "Южный Вокзал"
It comes seven years after the Scottish government scrapped plans for a direct rail link on the grounds of cost. If approved the system would be operational by 2025, with construction due to begin in 2022. Four tram-trains per hour would run in each direction taking travellers between Glasgow Central Station, Paisley Gilmour Street and the airport. The tram-trains would travel from Glasgow Central to Paisley before joining a new tram-line system to complete the journey to the airport. The interchange point at Paisley Gilmour Street would allow passengers destinations on the Ayrshire and Inverclyde train lines to access the service. The proposals are part of the £1bn city deal announced for Glasgow in 2014. The leader of Glasgow City Council Frank McAveety said the project was “essential”. 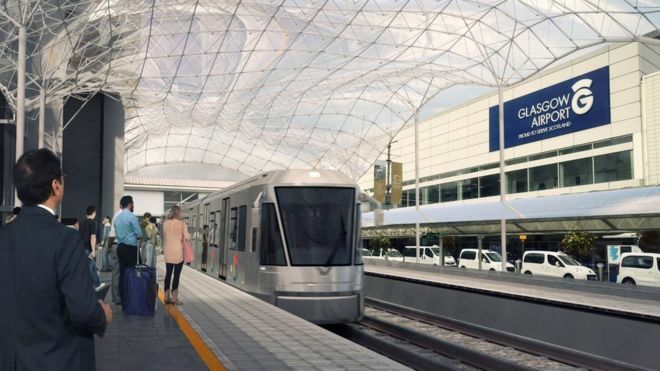 The Labour councillor said: “We’ve long argued that a new rail link between the airport and the city centre is essential for the thousands of tourists and business travellers who fly into and out of Glasgow every day. Located at the intersection of Al Sufouh-Al Gharbi streets between Jumeirah Beach Residence 1 and Jumeirah Beach Residence 2 stations, the opening of the turns will make life easier for motorists. All left and U-turns were closed ahead of the opening of Dubai Tram in November 2014 to ensure road safety. The closure of the turns ensured that there were zero tram-related accidents. According to RTA, the reopening is being done after ensuring that road users are accustomed to the existence and movement of the tram. This is the third location along the tramway that has seen an opening of left and U-turns this year. In March, the intersection of Al Sayora-Al Sufouh streets and Al Marsa-Al Sufouh streets at Jumeirah Beach Residence saw the opening of all turns, while in June Al Marsa-Al Sharta streets intersection saw a similar development. According to Maitha Mohammad Bin Adai, CEO of RTA’s Traffic and Roads Agency, a committee of specialists was set up and an international consultant was appointed to draw up a comprehensive plan to realise the Tram/Roads Safety Strategy. “The plan encompasses organisational procedures encapsulated in 15 strategic recommendations integrated in a five-year plan covering programmes, procedures and initiatives undertaken in collaboration with strategic partners with the aim of achieving zero accidents level in the operation of the Dubai Tram by 2020,” said Bin Adai. Luxembourg Infrastructure Minister François Bausch has defended a decision to issue a call for tender for the full tram route even though MPs have only greenlighted the first stretch between the central station and Luxexpo. Alstom is opening the second tram line with greater Le Mans council in the presence of Jean-Claude Boulard, mayor of Le Mans and president of Le Mans Métropole, and François Papin, Site Managing Director of La Rochelle. The network is growing from 15.4 km to 19 km and the Citadis fleet is expanding from 26 to 34 trams. The eight new trams were ordered in 2012 to reinforce the service on line 1 and to operate on line 2. Thirty metres long, the Le Mans Citadis trams already carry more than 48,000 people a day. Bringing the eight extra trams into line with the regulations on passengers with reduced mobility and making them more accessible required some major modifications: some seats have been widened, buzzers have been added to the doors, a flashing display and an intercom have been placed next to the exit and the handrails have been improved. The Le Mans urban transport service SETRAM has also upgraded the 26 trams already in service on the network according to processes defined and deployed by Alstom, which provided logistics and parts. The city of Le Mans now has a fleet of 34 modern trams adapted to the specific needs of people with reduced mobility.